It’s time to Cheat India! Following the success of Tumhari Sulu, T-Series and Ellipsis Entertainment re-unite for CHEAT INDIA, an edge-of-the-seat drama to be co-produced with Emraan Hashmi Films. T-Series and Ellipsis Entertainment are repeating their partnership following the box office success of the acclaimed Vidya Balan-starrer Tumhari Sulu. 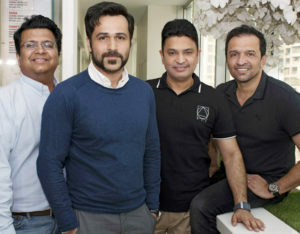 The two front-running content companies have partnered with Emraan Hashmi Films on their next production, Cheat India. The edge-of-the-seat drama, largely inspired by real incidents, will be directed by Soumik Sen.
Emraan Hashmi will headline the film, which takes a startling look at the crimes in the Indian education system that has created a parallel eco-system infested with greed harvesters. Cheat India is slated for a February 2019 release.